The area is overlooked by residential flats and used by hundreds of people every week. It is currently neglected but could be transformed into a vibrant and colourful wildlife corridor that would make the heart of Whitby visitors and residents sing! 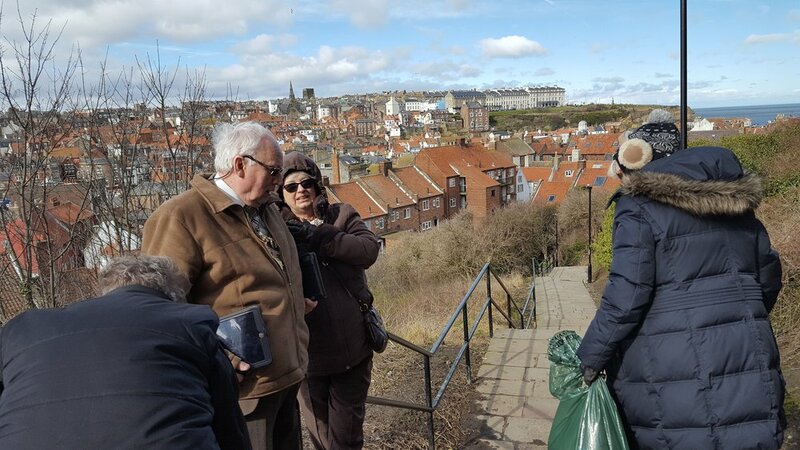 Our idea for improving the local neighbourhood is to transform the stepped pathway that leads from Whitby Abbey car-park into the centre of town by clearing away the rubbish, removing the excessive bramble growth, painting the railings and seats and planting wild flowers and sustainable wildlife friendly shrubs. The project will be delivered by Whitby in Bloom in conjunction with local community volunteers. It will immediately benefit the residents of Wells Court but overtime will benefit the community of Whitby by enhancing visitor impression and providing an increased sense of civic pride and community cohesion. The project will be promoted through the Whitby in Bloom website and Twitter and Facebook account, volunteering events such as the Great British Spring Clean and through the use of local media such as the Whitby Gazette and Yorkshire Coast Radio. We have organised a litter pick in conjunction with the Great British Spring Clean on the 23rd March which was attended by 25 pupils and 2 staff from Eskdale School, members of Totally Socially (Whitby) and Wells Court residents, Bloomers and Scarborough Borough Council Mayor and Mayoress, Cllr Sandra Turner and SBC staff.